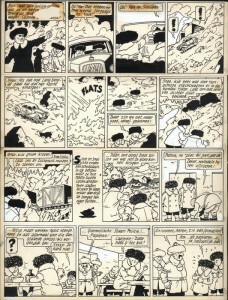 Here’s a detail from the career of Bob De Moor which is not that well known. 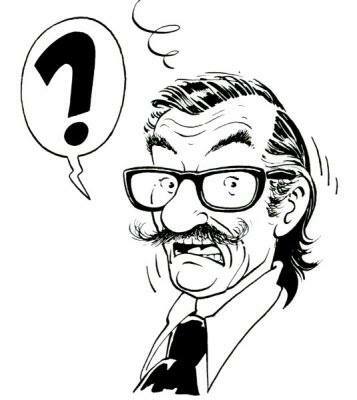 Online for instance there is no single website mentioning this. But here you have all the details. We expect this story to develop further so a follow-up story will most probably happen. 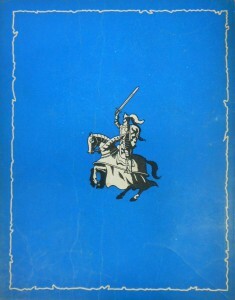 All starts in 1949. 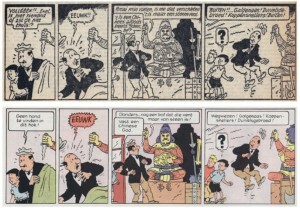 That year the comic adaption of Hendrik Conscience‘ “De Leeuw van Vlaanderen” by Bob De Moor is published in the flemish edition of the Tintin weekly, Kuifje. 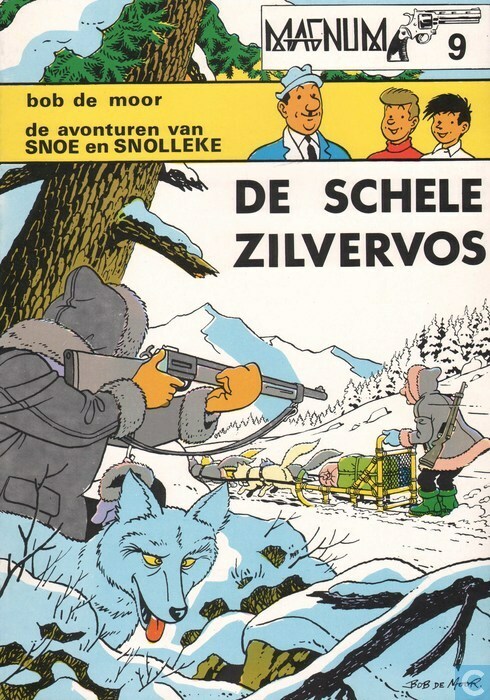 One of the readers is extremely impressed: Willy Vandersteen, the father of Spike and Suzy. 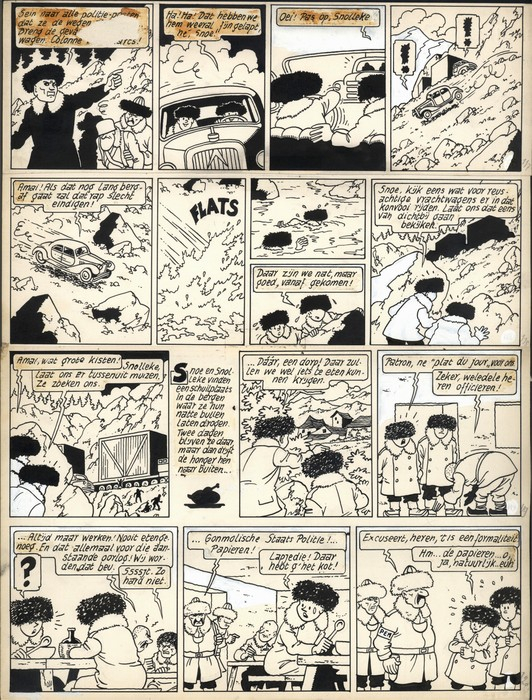 He wouldn’t be the only one being impressed by De Moor’s work, also Hergé was. 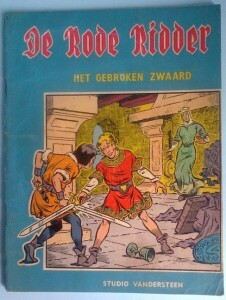 2 years it was Vandersteen’s turn to show what he was capable off when Karel Van Milleghem – the chief editor of the Kuifje weekly and a flemish nationalist – asked Vandersteen to create a historical comic based on a flemish hero. 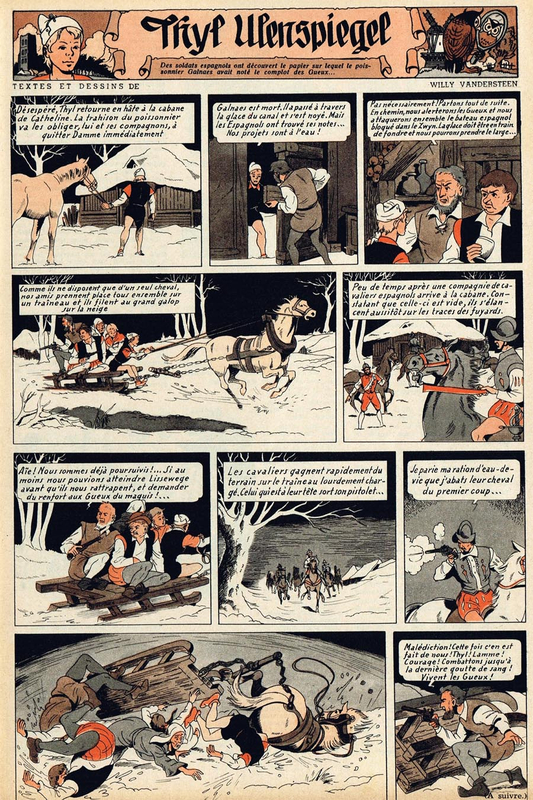 Willy Vandersteen decided to go for a comic based on Tijl Uilenspiegel aka Till Eulenspiegel, an impudent trickster figure originating in Middle Low German folklore, namely in Germany, Denmark, the Low Countries, the Czech Republic, Poland and Italy. 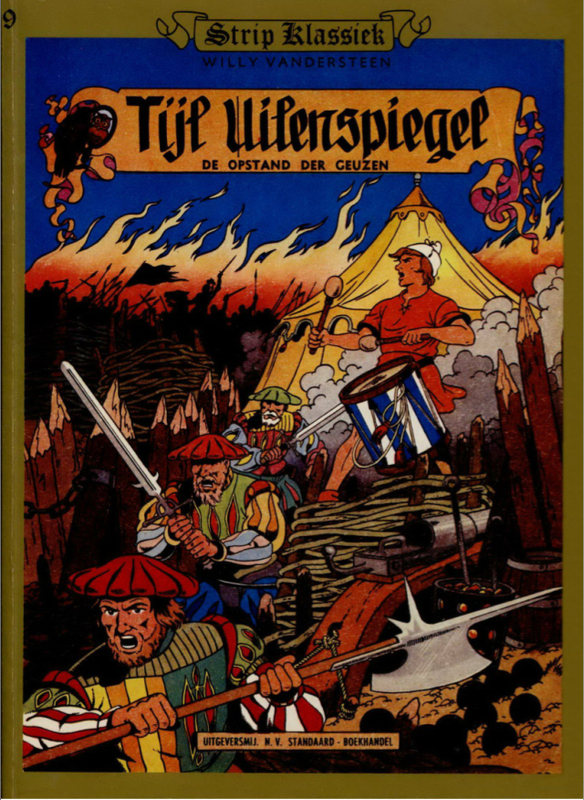 For the ‘petite histoire’, Tijl Uilenspiegel made his main entrance in English-speaking culture late in the nineteenth century as Owlglass, but was first mentioned in English literature by Ben Jonson in his comedic play “The Alchemist” or even earlier – Owleglasse – by Henry Porter in “The Two Angry Women of Abington” (1599). 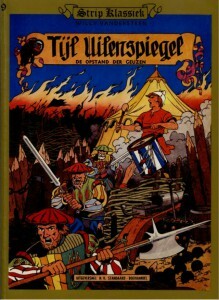 But Vandersteen’s Tijl Uilenspiegel was based on the 1867 novel by Charles De Coster, “De Legende van Uilenspiegel”. 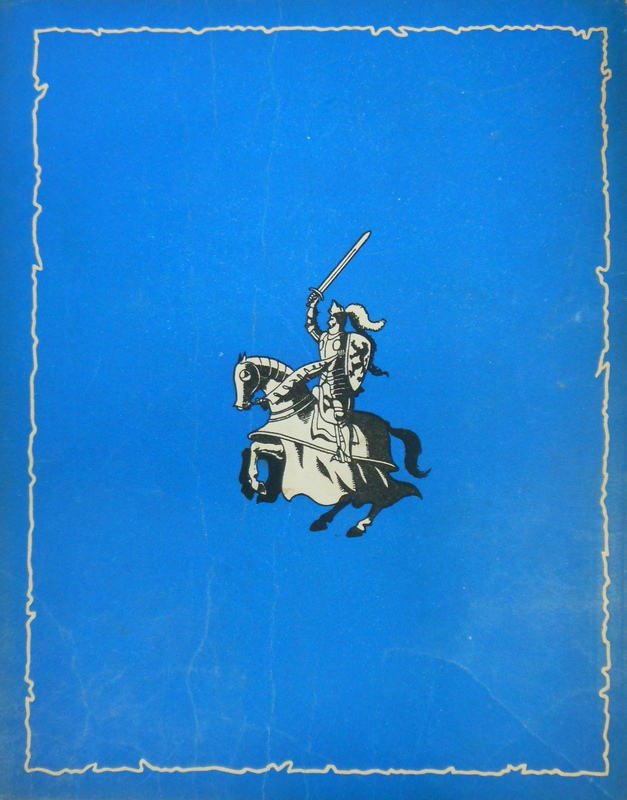 He wouldn’t stick to just that novel so for the first album Vandersteen chose to go for setting based on the “Eighty Years’ War” or “Dutch War of Independence” (1568–1648). 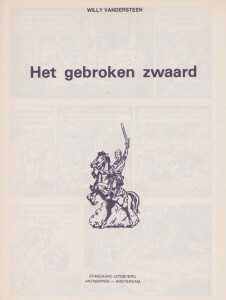 The story started in the Kuifje weekly on September 26 1951, a special issue celebrating the 5th anniversary of the weekly. 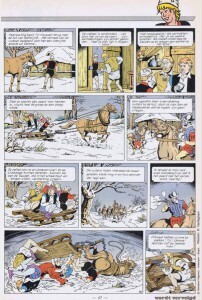 The story was called “Opstand der Geuzen” and was an immediate success not in the least by the way of drawing which reminds of the detailed way of working he also used for the (golden) period Spike and Suzy were published in the Tintin weekly. Not surprisingly Leblanc asked Vandersteen to continue the series. But you’ll learn more on the follow-up album in another article when we show you how Bob De Moor was involved there as well. 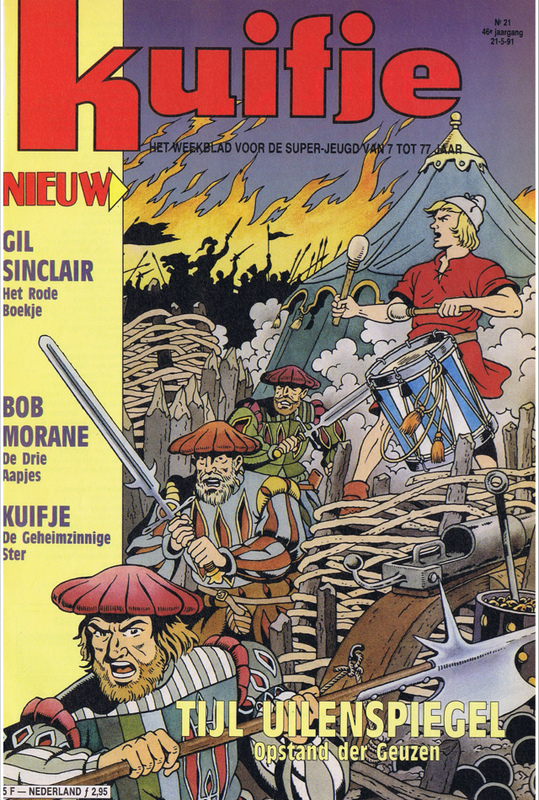 Today we’ll focus on that very first story because Bob De Moor was asked to help out the Vandersteen heirs when in 1991 a republication of the story via the Standaard Uitgeverij was imminent. 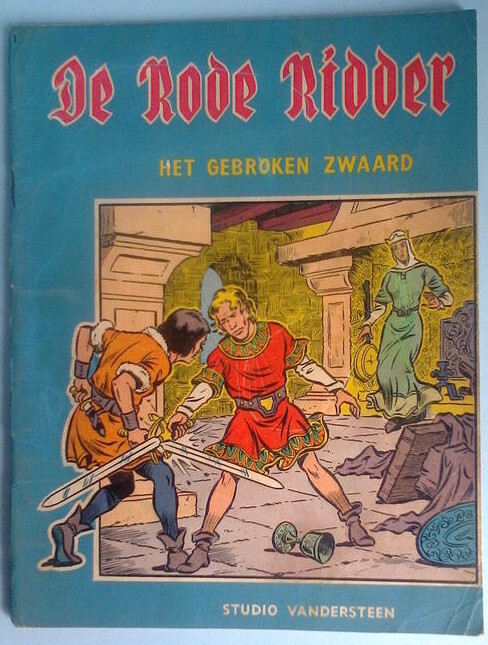 De Moor’s help was needed because the Vandersteen studios could no longer locate the original drawings of the pages 39 and 40 and also lost the artwork of the cover. Bob De Moor at that time saw his Johan & Stefan re-published via the Standaard Uitgeverij. 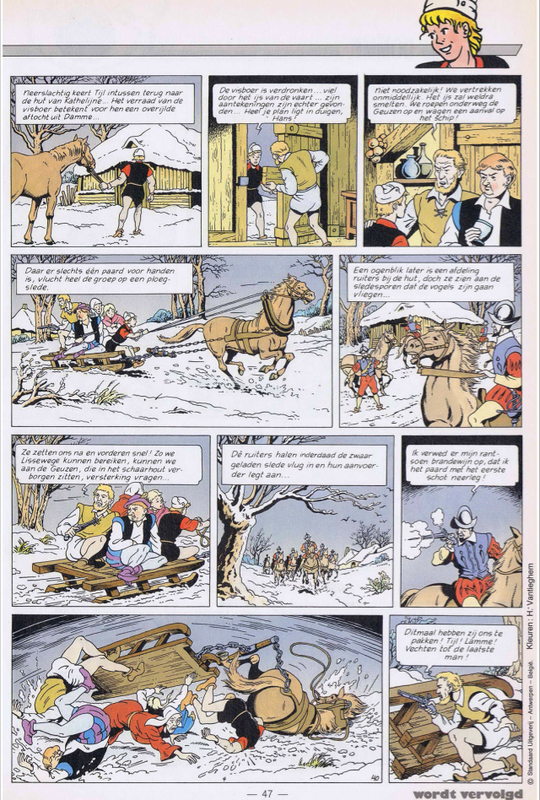 Bob De Moor redrew both pages and while he was at it also corrected frame 2 and 5 on page 40 (can you spot the 2 corrections?). 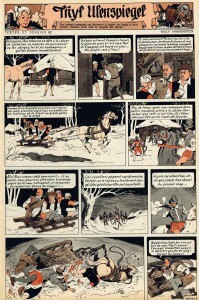 For the rest De Moor stayed extreme faithful to the original drawings. Only here and there you can notice some minor differences. 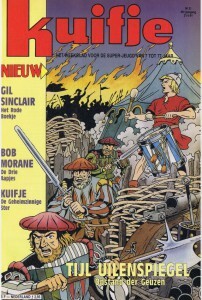 Since the cover artwork was missing Bob De Moor also redrew the cover artwork which was also used for the reprint in the Kuifje weekly in 1991. A trained eye will immediately recognise a typical ‘Cori’ hand for the soldier on the front for instance and there are some more give aways if you look carefully. 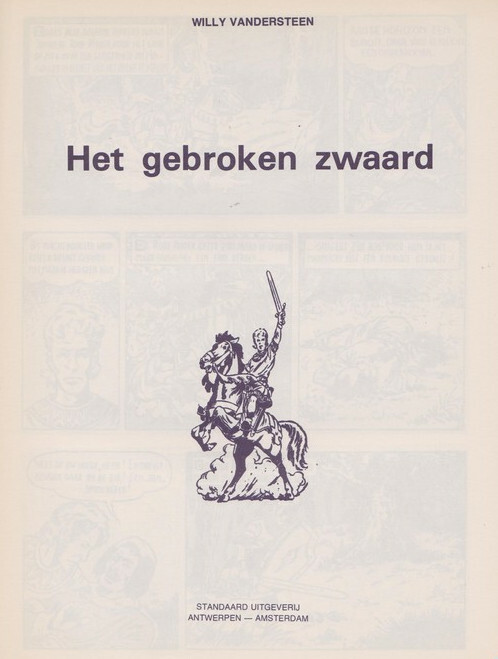 In that respect Bob De Moor has a lot in common with Dirk Stallaert who nowadays is also ‘recreating’ various album covers for reprints of some of the Vandersteen collection (and other series for which the artwork has been lost overtime). 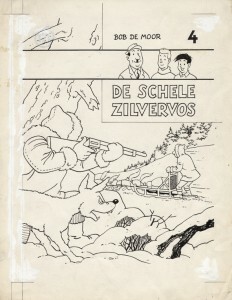 Just like Bob De Moor Dirk Stallaert seems to have no problem to appropriate a certain style. 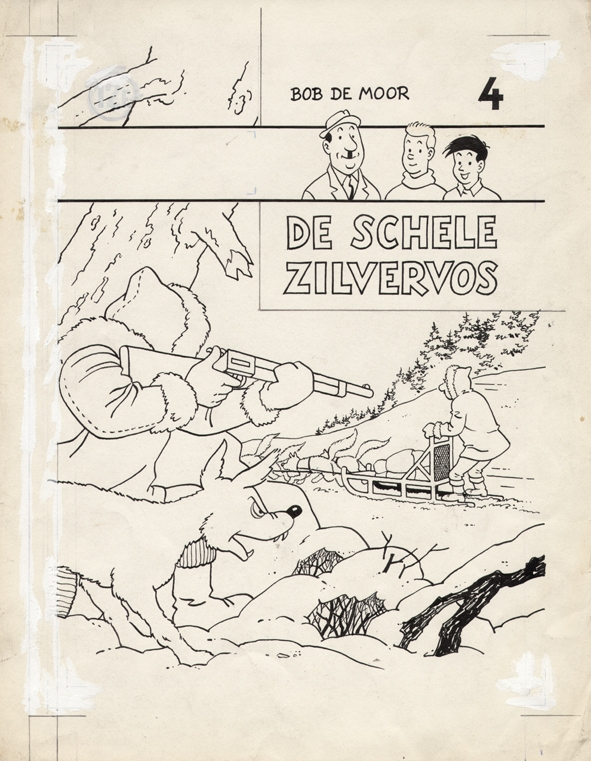 Bob De Moor and Willy Vandersteen were really good friends, it would result in extra good family ties later on as we will show. 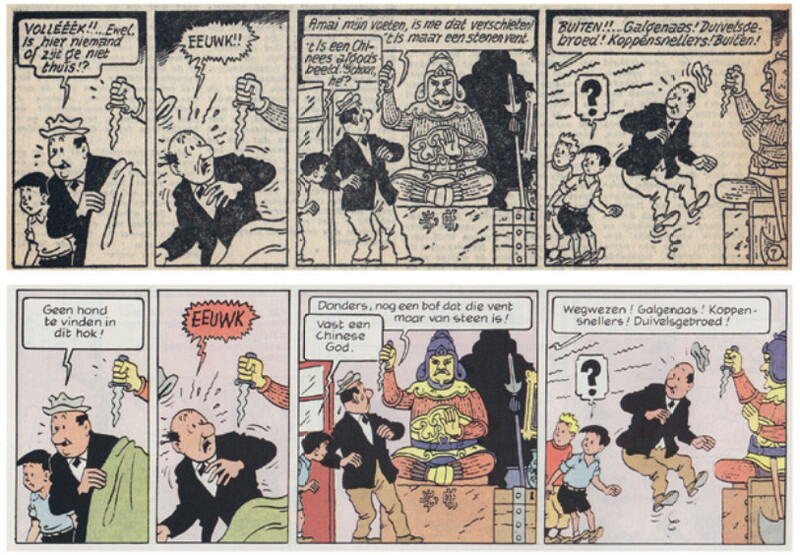 We can only imagine that it must have been with a lot of pride and true friendship that Bob De Moor re-created the work of Willy Vandersteen who died a year earlier, in 1990.